In the first week of January, the Maharashtra state pollution control board ordered the shutdown of 27 chemicals factories in Khed taluka of Ratnagiri district. The factories from the Lote-Parshuram industrial area were found emptying untreated effluents into a rivulet that contaminated the reservoir downstream. The Boraj dam reservoir is the only source of drinking water for 13 villages in the area and partially meets the water needs of Khed city. The contamination was first detected on December 27 by a villager who operates the jackwell for regulating flow of water from the rivulet to the dam. 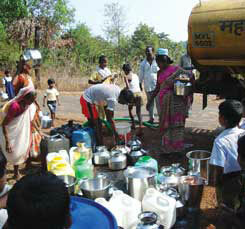 He noticed the colour of the water was red, said Jayshree Sanjay Padekar, the sarpanch of Boraj village. People rushed to the spot and noticed dead fish floating in the water; the grass blades on the sides of the rivulet, Pakhadicha Parya, were burnt. They concluded the tanker they had seen on the bridge the night before must have poured chemicals into the stream. On receiving complaints, a municipal employee in the nearby village cut off the supply from the dam. Officials of the state pollution control board (spcb) visited the site and collected samples. Results showed the water had turned acidic (see box). The villagers who are now getting drinking water through tankers are angry with the officials for not heeding their previous complaints. “Factories of Lote-Parshuram have been polluting our waters and fields in the past decade. The authorities have sprung into action only now because water supply to Khed city has got contaminated,” said Suresh Dhondu Mandavkar, sarpanch of Kotawali village, five km from the industrial area. The villagers alleged some factories were open even after spcb’s closure order. “We have issued directions to 27 industries to stop activities and have asked the authorities concerned to cut their water and power supply,” said D K Khedkar, spcb’s regional officer. He said certain factories were given three days of extra time for safe closure because abrupt closure can lead to accidents. But some of the factories continue to operate in defiance of the order even after the lapse of three days. On January 18, another tanker emptied chemical effluents in front of a chemical factory within the industrial area. Anuj Joshi, a reporter with a Marathi daily who visited the site, said spcb orders have had little effect. The Lote-Parshuram industrial area, managed by the Maharashtra Industrial Development Corporation (midc), has 138 factory units. Over a hundred of them produce chemicals. The industrial area has a common effluent treatment plant (cetp) managed by a factory owners’ cooperative. Villagers alleged the cetp is hardly operational and most of the time toxic sludge is spread out in the open for drying. “During monsoons, this sludge flows out and gets deposited in our fields and waterbodies,” said Mandavkar. A visit by the Down To Earth correspondent to the industrial area on January 17 confirmed the villagers’ claims—one metre thick layer of toxic sludge was spread out on plastic sheets in an area of about one hectare. The sludge tank of the cetp was shut down for repair. The operations manager of midc accepted that drying of the sludge in open was illegal. The industrial area is on a plateau and the untreated effluents flow down and contaminate the river Vashishti, which joins the river Jagbudi and the Arabian Sea through the Dabhol Creek (see map). The treated effluents from the cetp are carried through a 15 km pipeline and emptied into the Dabhol Creek. “The effluent is not properly treated and this has killed the fish and marine life,” said Sandip Ananth Amre, a member of the Kotawali gram panchayat. 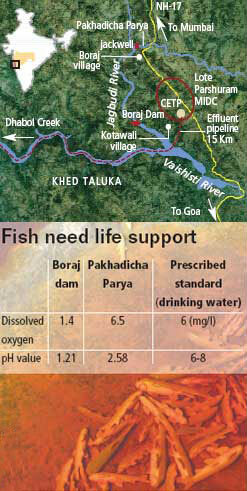 The local fishing community, the Bhois, are the worst affected, Amre said. The midc official refuted the allegations and said the “pipeline is fixed immediately whenever it breaks down”. Villagers said the factories have also destroyed agriculture. “Our area was known for mangoes, coconuts and paddy. But now the coconuts have no kernels and the paddy has no grain, only husk,” a villager said.